So did you notice the new name change up there in that pretty little URL bar? How about the header? That’s right. I’ve switched. For someone who is not a fan of change in the least bit, this is a huge step for me. I am proud to say that I think my original focus word of 2017 is starting to come along nicely. But, before I get ahead of myself let me take a few steps back and tell you how all this came about. When I started The Outnumbered Nest I was a new mom of (another) boy. It was the first time I was staying at home and I needed a way to get “out” without having to put on clothes. So The Outnumbered Nest was born. It was a beautiful blog and I will forever be grateful for it because it led me here. When I started the blog, I was looking for my purpose. Obviously, my purpose includes being a wife and a mother and I cherish every moment of being both of those things. However, I always felt like something was missing from my life, some purpose that needed to be met. I had felt this way a lot during my life. I felt that way when I was in High School and told I was “too smart” for what I wanted out of my life. When I was in college and miserable trying to get a degree in something that I wasn’t even interested in but wanted to make everyone else happy. So that’s kinda the short story of how “finding purpose and positivity” came into the mix. It’s something I’m passionate about, about building others up and letting them know that there is always someone in their corner. While The Outnumbered Nest started as a parenting blog it grew. It led me to a friend who in turn introduced me to Young Living. Ya’ll I have found another purpose. I didn’t realize how much essential oils would touch my soul. I didn’t realize how much I needed chemical free living. Why am I so passionate about it? Honestly, why is anyone passionate about anything? It’s just something deep in my soul that connects with it all. I know many people think, well the chemicals didn’t hurt me so they won’t hurt my babies. But is that really true? How do we know? Many of these things haven’t fully been tested yet. I can tell you that my Nana swears people are sicker today than they ever were as she was growing up. She don’t remember the “C” word being as rampant as it is now. There is a reason for that. I must believe it is the chemicals in the food, the things we clean our homes with, and the air we breathe. I may not be able to control it all, but why not control what little I can? I give you this big long story to introduce you to DeAnnaHill.com, or sometimes I’ll spell it out as DeAnnaHillDotCom Depending on what we are doing and where we are at. Mainly because refer to my site as “DeAnna Hill” is just odd to me. 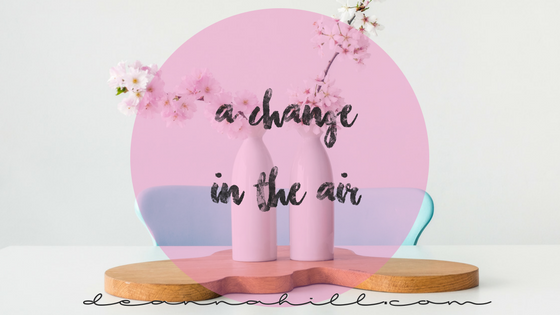 I hope this blog will bring lots of good information your way as I touch on wellness products, parenting, faith and anything else my little heart desires. I am so thankful that you are on this ride with me! I just found your blog. I'm excited to go back and read more of your parenting posts and see where you go from here. I try to use and eat as organically and naturally as possible and I love to hear about other people's opinions and experiences. My mom has actually recently turned me onto essential oils and they're in danger of becoming my new addiction ;) I still have a lot of research to do but the ones I've tried have really made a difference (one in particular helps with shark week, if you know what I mean). Thanks so much for stopping by! I am thrilled that you enjoy it here. I could talk all day about Essential Oils and if you would ever like to chat one on one Please send me a message! I would love to chat about your oily journey! Thanks again so much for giving me your very kind words!